Heat oven to 375°F. Separate dough into 8 rolls. Spoon icing from can of rolls into small microwavable bowl; cover and refrigerate. In medium bowl, mix flour, brown sugar, cinnamon and butter with fork until crumbly. Mix in pecans; set aside. In ungreased 9-inch pie plate, place 1 roll in centre; pat and press to stretch. Surround with remaining 7 rolls; press seams of dough to cover entire bottom of pan and seal. Bake 10 minutes. 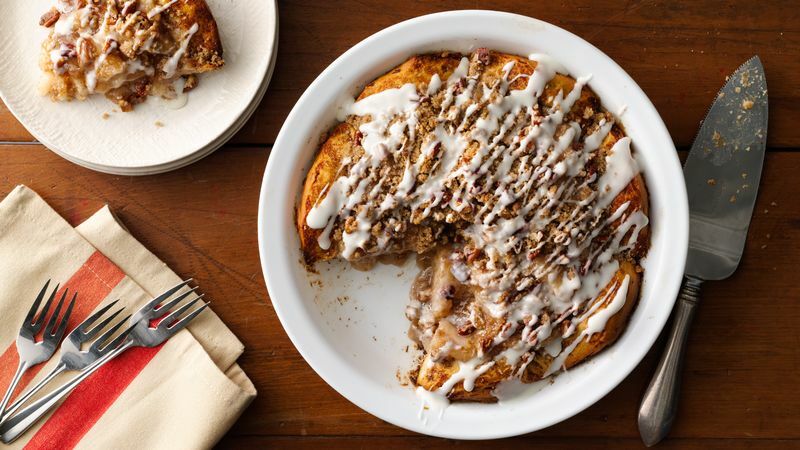 Spoon pie filling over cinnamon roll crust; top evenly with streusel. Cover edges of crust with strips of foil. Bake 25 to 30 minutes or until top is golden brown. Cool on cooling rack 1 hour.